This past weekend, Dartmouth engaged in a home friendly with American International College (AIC). The Big Green was looking to improve on their performance in the BC game in the build up to the Ivy season, which starts with an away game against Cornell on October 3rd. AIC proved to be a tough, physical opponent and won the match 74 to Dartmouth’s 14. Throughout the game, AIC collected most of their points from strong runners that were able to penetrate the Big Green’s defensive line. 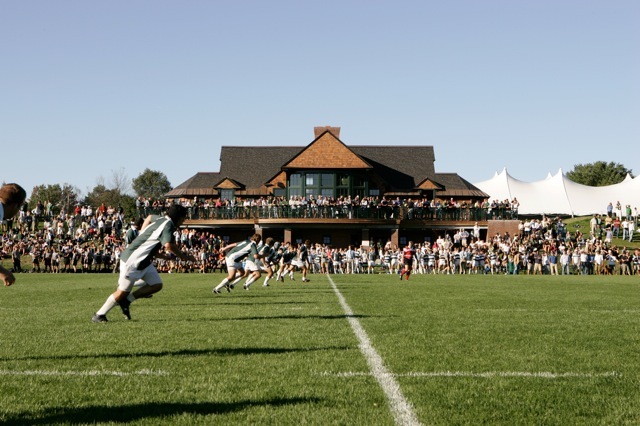 Dartmouth scored their first try when Dawit Workie ’17 took the initiative to take a penalty quickly and run the ball in from 15 meters out from the try line. While the Big Green came out of the locker room resilient to overturn the first half deficit in the second half, the team proceeded to defend for the vast majority of the remaining. As the game approached its end, Dartmouth managed to secure a line out deep in AIC’s territory after being awarded a penalty. The team collected itself and was determined to end the game with a try of their own. After possession was retained at the line out, the ball was shifted across the field with quick hands to spread out the defense. The forwards then rucked aggressively providing quick ball to be distributed to the back line. After the ball had worked its way back, it ended up in the hands of Chinedu Okafor ’16, who drove forward and exploited a gap in AIC’s wall to score his first try for Dartmouth Rugby after only recently picking up the sport. Strong and notable individual performances throughout the game came from Ollie Engelhart ’18 and Dawit Workie ’17 – two men who consistently punched above their weight when tackling and maintaining the defensive line. The Big Green plays Navy in their final preseason game next Saturday (26th) on Brophy Field. The team will be looking to continue their improvement in the lead up to the Ivy season with a strong performance against the visitors.